Bea Wray of The Creative Coast interviewed Eric Darling for the organization's weekly podcast, which features some of the area's most innovative and creative people. Have a listen! The Georgia Ports Authority has won a 2015 AAPA Communications Award of Distinction for the animated holiday greeting card produced by eThree Media in conjunction with Longwater & Company for the 2014 holiday season. In eThree Media's second consecutive year of sponsorship of TEDx Creative Coast, we produced all the presentation videos and live streaming of the event from the Telfair's Jepson Center. The three-camera live-switched event saw fifteen (15) inspiring presentations centered around the theme, "Balancing Act." eThree Media is proud of our continued association with the world's most intriguing voice for "Ideas Worth Spreading." 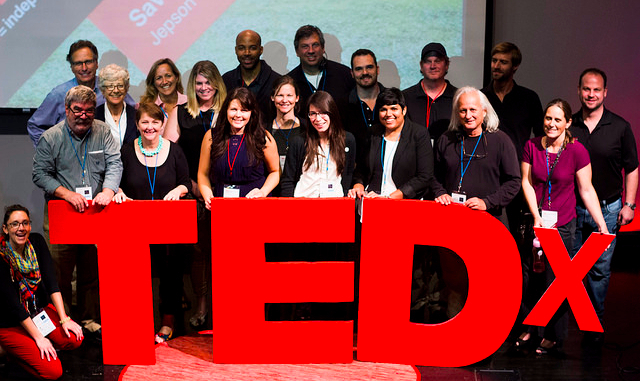 Watch the videos on the TEDx Creative Coast's YouTube channel. 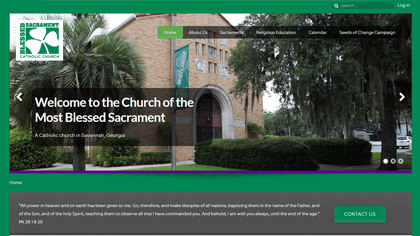 eThree Media is proud to announce the completion of another new web site for the Church of the Most Blessed Sacrament, one of the Savannah area's Catholic parishes. Two years ago, eThree Media rebuilt the Blessed Sacrament School web site, which has thrived under constant content upkeep by school personnel. In the same vein, this new web site for the church also offers direct management by parish office staff, meaning that calendar changes, edits to existing pages, and file attachments for parishoners can be easily made without any intervention by eThree Media. It is eThree Media's philosophy that control over site content always belongs in the more capable hands of our clients. So, we strive to break down any barriers for them wherever possible. We pride ourselves on our web development capabilities, but we like to turn over the keys to our clients, to let them see to the day-to-day aspects of running their web sites. 2014 marks the first time that eThree Media partnered with the Ocean Exchange, a non-profit organization founded in 2010 and dedicated to advocating for innovators through building connections with organizations. Their annual event held in Savannah culminates with the awarding of two $100,000 prizes for the most compelling solutions aimed at solving some of the world's biggest ecological challenges. eThree Media produced the video of the event itself, utilizing multiple cameras and feeds from the video and slide presentations over three days at the Savannah International Trade and Convention Center. Switched live using our collection of portable studio equipment, eThree Media is proud to deliver high quality finished HD video assets ready for publication in whichever venues deemed appropriate by the Ocean Exchange immediately following the event. Blue Voyage Productions served as our technology liaison with the Ocean Exchange, taking our nearly finished assets, and adding some sponsorship information to each video prior to posting online. Director, Nate Nauert of HD Savannah, asked eThree Media to help with color correction and grading for his series of TV Spots for AXE Deodorant. AXE rewarded our combined effort with a public social media campaign that began rolling out today. Other members of the all-local Savannah cast and crew included: Anthony Paderewski, Beth Nelson, Charlotte Nauert, Jody Schiesser, William Hammargren, Michael Jordan, Drew Hunt, Harrison Russell, Jaz Wright and Justin Kent. 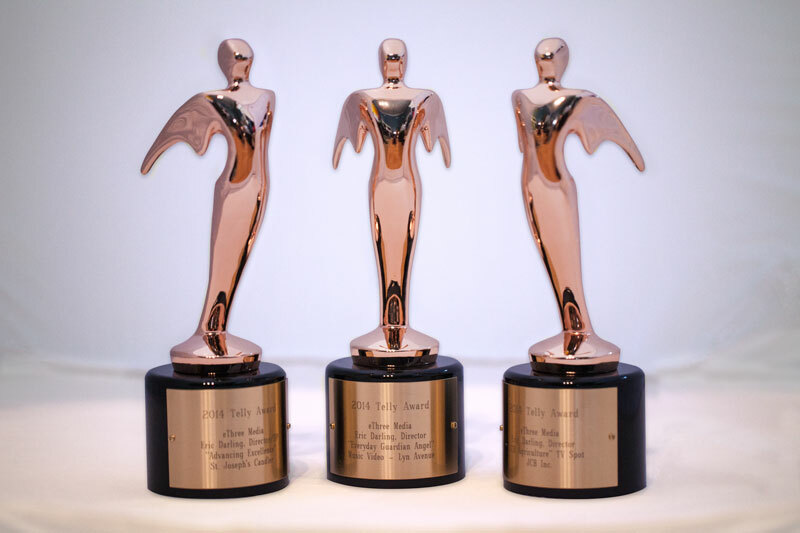 eThree Media wins three 2014 Telly Awards for projects completed in 2013. For the 8th consecutive year, eThree Media is proud to have been selected as the sole vendor for South University commencement activities in Savannah, Georgia. 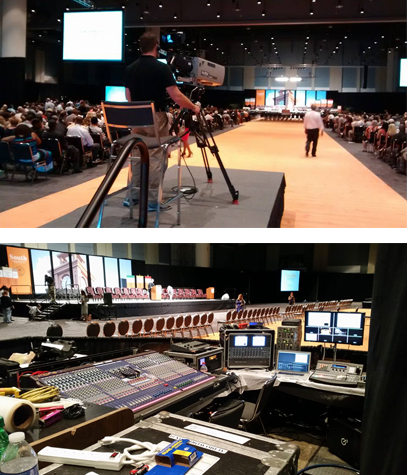 Over two days, four separate crews handled independent video projects that ran concurrently at the Savannah International Trade and Convention Center, including the main commencement ceremony itself, which is held in the full Exhibit Hall. The Commencement ceremony required four (4) camera positions, switched live to six (6) large screens for over 7,500 people in attendance. The show included real-time keyed graphics for identifying speakers at the podium, along with full screen graphics that were both static and moving. Additionally, a sign language interpreter was boxed in a PIP window and brought in and out during spoken word sections of the program. 2014 also marks the first year that the switched live show was streamed to the Internet, where hundreds of additional viewers watched from all corners of the country. "Our infrastructure and working knowledge makes us uniquely prepared in the southeast Georgia region to handle complex projects with so many moving parts," said Eric Darling of eThree Media. "Our crews have done this many times now, and we understand how to produce a high quality video product for a live setting with many eyes watching." Watch the archived Livestream of the event as it happened. Today marks the first time that eThree Media has supplied video production services to the TEDx Creative Coast annual event. The event is coodinated by The Creative Coast in Savannah, and ran to a sold-out crowd at the Telfair's Jepson Center for the Arts Auditorium. eThree Media utilized three cameras, and took a feed from the presentation system to switch the event live. The event was streamed live on the Internet and recorded for later delivery on YouTube. Location sound and lighting for the event were produced by Stagefront Presentation Services. Super Bowl Commercial is "Best of Savannah"
eThree Media's Jamie Casino Super Bowl commercial has been named by Connect Savannah as the Best Local TV Commercial in their annual "Best of Savannah" awards.